With Halloween only 3 days away you may have found yourself frantically looking online and in stores for different types of table decorations and Halloween ideas for decorating your home. We have recently sourced a selection of beautiful flowers and bouquets which are perfect for adding a darker, more gothic tone this Halloween. 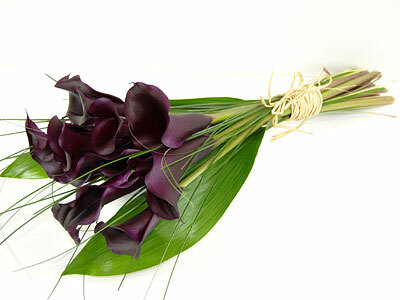 One of the classic type of flowers that are perfect for any Halloween celebration are our sublime Black Magic Calla Lilies. These lilies come in a deep, dark mix of red, burgundy and purple for a rich, luxurious appeal. Our Calla Lilies look slightly different under varying light shades, from a brighter tone in the sun to a darker, more alluring tone during the evening. These roses are perfect for any budding Black Widow this Halloween and adds an aura of mystique to your surroundings. A great alternative to a Black Rose, our Calla Lilies look beautiful in a thin vase, and can finish off the overall design and decor of your room. Not to mention they are perfect as a romantic gift for your partner. These Lilies are delivered to you via our next day delivery service to ensure that you receive them fresh and ready to put on display, and we can also include a vase or handwritten note for an additional cost at time of ordering.